There are 16 official sites on the Boston’s Freedom Trail. Many years ago there was a red line that you just followed, but after the Big Dig all you will find are many dead ends. 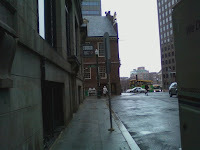 So, look at the links provided and city of Boston website maps and start with what I think is the most important location on the Freedom Trail, the Old State House or the command center of the British military during the occupation of Boston. The most significant events in the establishment of our independence from British rule took place here, among them the Boston Massacre and the public reading of the Declaration of Independence. Today this structure lies in the shadows of skyscrapers and our 21st century world. But within this block there are still little alleys and corridors that on a quiet day, especially this week deserted of humans by the incoming storm, whi ch still makes one pause to respect the spirits still haunting these grounds. For those who haven’t seen the HBO John Adams series, I strongly recommend viewing, at least the beginning episodes. Although filmed near Williamsburg, Virginia, the Boston scenes are quite realistic in giving a sense of the events that took place in this small little section of Boston during the buildup to the Revolutionary War. 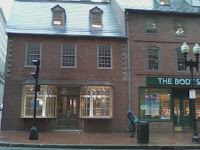 From the Old State House there you could go either one of two ways: toward the famous Faneuil Hall and Quincy Market area or head up toward the Old Corner Bookstore. Preheat oven to very hot temp (450°). Stir all ingredients and half hot milk. Place in hot oven for 10 minutes or until mixture starts to boil. Then add remaining hot milk. Lower temperature to a “slow oven heat”. I used 225° for 5 hours then lowered to 180° until ready to serve. If you want another type of dining experience, head to the North End by heading east past Faneuil Hall (could do a side trip first to the Black Rose Irish Bar). Find your way to the lower part of Hanover Street. 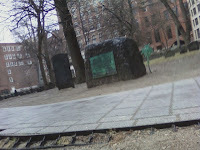 (see maps marked above for Freedom Trail). You could enjoy an Italian pastry at Mike’s pastry OR a nice meal at An tico Forno (small; a bit cramped; good ambiance) (cross over to Salem Street at Parmenter Street (runs parallel to Hanover) and turn left). I’ve included photos of some other digs in the North End. 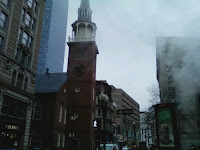 After meal or pastry head back up Salem Street to the second most famous spot on the Freedom Trail, the Old North Church where legend (not necessarily all true) was created from Longfellow poem about Paul Revere and this famous church. 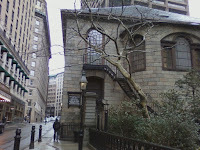 If you prefer you could start your walk at the Old State House go past the Visitors center to a little alley, walk up and you will find the famous Corner Bookstore, then walk up School Street to the site of the first public school in the U.S. past Kings Chapel, the Granary Burying Ground (among notables lying there are Paul Revere, Samuel Adams, several others who signed of the Declaration of Independence, and Benjamin Franklins parents), onto the Boston Common, then finish the tour at the Old South Church where the “real” tea party congregation met before heading to the harbor. Just down the street from the church you could have a meal (except Sunday) at the Milk Street Café, great Kosher, and vegetarian cuisine. Note: John Adams and John Quincy Adam are buried in Quincy, Massachusetts. I would strongly suggest a visit to the Adams national park as well, but you will need more time (a 30 minute subway ride). Great post! A couple of years ago my friends and I did a 4th of July Freedom Trail pub crawl. It was a ton of fun!